Solar technology has been the company’s primary focus for some time. The use of heat pumps and solar thermal solutions in both the household and commercial sectors has proven to offer a considerable saving of up 67% on hot water heating costs. We pride ourselves in being able to offer quality water heating solutions at competitive prices and with quality assured. Our solutions revolve around the use of two different technologies: Heat Pumps and Solar Thermal. For more information on these technologies. These technologies heat water using direct solar energy. Heat from the sun directly. Solar thermal technologies use solar collectors and storage tanks in order to harness energy directly from the sun and convert this into thermal energy. Thermosyphon System geyser and thermal collector located on roof. Pumped solar thermal system. 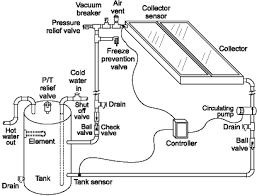 Thermal collector on roof and geyser inside roof.